· Users have an option whether to Encrypt or Lock, choices useful for both power users and casual users. Those who want ultimate security, can choose encrypiton. those who want ultimate speed, can choose locking. · There's no longer the hassle of encrypting each and every file on different locations. Think how much time you will save simply by putting all your files and folders in one location. Convenient encryption and decryption happens on-the-fly. · Both Encryption and Locking are exceptionally fast. No competitor is offering this speed while offering 100% secure 256-bit AES Encryption. · The Lockers can't be deleted on the computer where Folder Lock is installed and Folder Lock can't be uninstalled without the correct password. · Users who want to password protect folders on multiple locations on their hard disk, not just on the C: drive, can easily protect their files on another partition by copying the 'Lockers' from one place to another or by simply using the 'Lock' feature. · Secure and very strong Encryption. A strong industry standard 256-bit AES Encryption is used to encrypt your files for maximum protection. It is one of the most trusted encryption algorithms used in United States Military. · Folder Lock offers fully portability and it can even protect CD/DVD-RW, not just USB Flash Drive, Memory Stick and floppy disks. To protect data on these drives, you can simply copy or burn your Locker to that drive. · Lockers can also be emailed to someone over the internet. They won't be able to see your encrypted files without your password / permission. Even if someone breaks through and checks your email attachment in between, he won't be able to decrypt or use this information without the correct password. · Folder Lock works flawlessly on all Next Technology Windows, i.e. Windows Vista / 2003 / XP / 2000 / NT. It is also fully compatible on all disk drives types including FAT16, FAT32, NTFS and EFS. · You can increase the size of your Locker by simply adding more files and folders into your Locker. Even if you are left with little space in your Locker, you can always increase its size. · Brute force cracking is not possible, since the program delays for some time once a password is entered. This will prevent hackers who may try many different combinations of passwords to get through your files. The program also produces a load beep when an incorrect password is entered, to alert the administrator of possible hack attempt. · Password Strength meter shows you the strength of the password as you type, while you're setting a new password. Basic rule of thumb is to use a password that is easy to remember but hard one to guess. · Folder Lock doesn't save the password in the registry or the disk, preventing hackers and crackers. · Folder Lock also offers Auto Protect and Auto Shutdown features, this setting automatically locks or shutdown if more than five incorrect passwords are entered to try to decrypt the files. · Folder Lock erases tracks of users when they click the lock button. It deletes recent document history, find file and folder history and the data in clipboard when you close the Locker. · Protects important files from viruses, hackers, crackers, trojans, malware, spyware, worms, malicious programs and scripts. Protects files from network computers if you do not want to share files on network. Also protects files from hacker tools when you connect to the internet. · While using the Lock feature, users can choose to lock & hide their files simultaneously. Locked & Hidden files are unrenameble, undeletable, unmovable and totally inaccessible. There is no limit to the size of data or the type of files you can protect. · With its reduced file size and compact design, Folder Lock takes only 3.5 MB of hard disk space - small, portable and easy to keep. Thanks to the latest compression techniques. The GUI and interface is so well designed, it looks like an integral part of Windows XP. · Folder Lock isn't required to run at all times. Moreover, it doesn't save anything to the registry/run so that users do not have any memory problems or stability problems with the program. You cannot download any crack or serial number for Folder Lock on this page. Every software that you are able to download on our site is legal. There is no crack, serial number, hack or activation key for Folder Lock present here. Our collection also doesn't contain any keygens, because keygen programs are being used in illegal ways which we do not support. All software that you can find here is freely downloadable and legal. 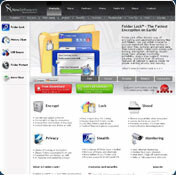 Folder Lock installation package is prepared to be downloaded from our fast download servers. It is checked for possible viruses and is proven to be 100% clean and safe. Various leading antiviruses have been used to test Folder Lock, if it contains any viruses. No infections have been found and downloading Folder Lock is completelly problem free because of that reason. Our experts on malware detection tested Folder Lock with various spyware and malware detection programs, including fyxm.net custom malware and spyware detection, and absolutelly no malware or spyware was found in Folder Lock. All software that you can find on our servers, including Folder Lock, is either freeware, shareware or open-source, some of the software packages are demo, trial or patch versions and if possible (public domain licence), we also host official full versions of software. Because we want to be one of the fastest download sites on the web, we host all the software including Folder Lock on our servers. You cannot find here any torrents or download links that would lead you to dangerous sites.